Moby. Lift Me Up (Mylo Mix). MAYSKY.RU. MP3 МУЗЫКА. MTV DanceFloor Chart. Музыкально-развлекательный сайт. MP3, информация, биография, новости, фотографии, обои для рабочего стола, ссылки, рейтинг по каждому артисту, группе, исполнителю, DJ и по каждой песне! Lift Me Up (Mylo Mix). Born : September 11, 1965, New York, NY, United States. One of electronic music's most visible and talked-about figures by far, Moby's career comprises many years of work and many many musical twists and turns. His career stretches all the way back to early rave and acid-house releases in the late 80's and early 90's as U.H.F. and Voodoo Child, through to his much loved/hated r&b/blues/pop/techno sample cut-ups of today.His most notable tracks from his early days include "Next Is The E", "Everytime You Touch Me" and "Into The Blue", and the classic "Go", as well as his early albums "Ambient" and "Early Underground". A brief outing into more rock-oriented territory came with 1996's "Animal Rights", followed by "I Like To Score" in 1997, highlighting his past movie score contributions (most notably a remix of the "James Bond Theme").In 1999 and 2000, Moby found unprecedented pop success with the album "Play" and the slew of singles and radio tracks that came from it ("Honey", "Run On", "Why Does My Heart Feel So Bad? ", "Natural Blues", "Porcelain", "Southside", and more). Among other things, his appearance as a DJ in the foyer of the 2000 MTV Video Music Awards (wearing a gold suit and playing two golden copies of "Play") led many people to decry him as a sellout. 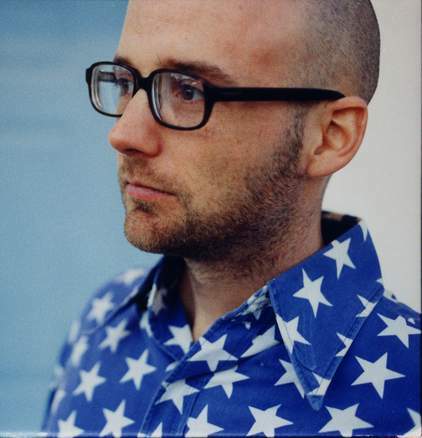 Nonetheless, his follow-up album "18" tinkered very little with the "Play" sound and still received a mostly positive reception in 2002.Besides the many faces of his music, Moby also gathers controversy for his outspoken religious, dietary and animal rights views, as well as persistent rumors that his live shows are mostly pre-recorded. Every Moby release from the mid-90's onward has borne the text "Animals are not ours to eat, wear or experiment on. Thanks to Christ." Aliases: Barracuda, Brainstorm, The Brotherhood, DJ Cake, Lopez, Mindstorm, Richard M. Hall, U.H.F., Voodoo Child. In Groups: Pork Guys, The, Schaumgummi, Shopwell, Vatican Commandos.